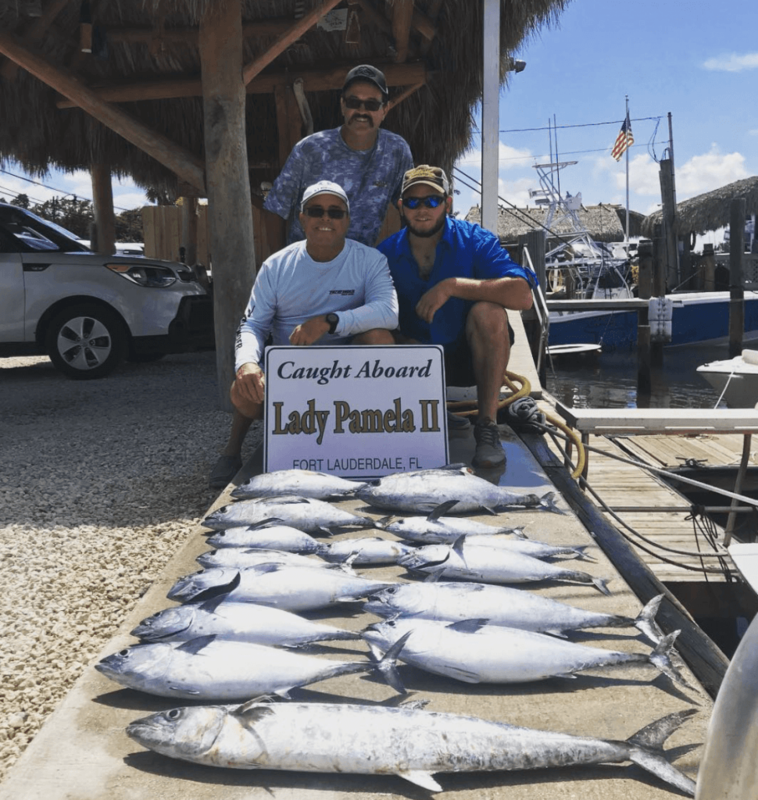 The Fall weather patterns are starting to take hold down here in South Florida and Lady Pamela Sportfishing continues to take full advantage of the subtle change in seasons! Our entire fleet continues to enjoy great fishing and big smiles from our clients. 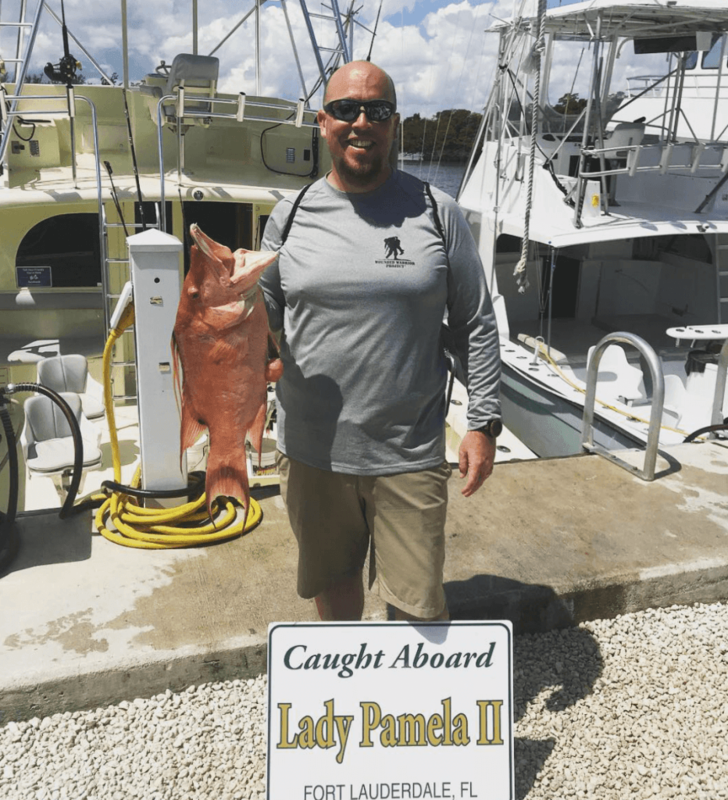 Thanks to all of clients both new and loyal, our boats are returning with plenty of fish to catch…and stories to go with them.The entire LP2 Team wishes to thank each and every client who fished with us aboard the Lady Pamela II Fleet throughout September. We greatly appreciate your business and hope that you’ll come back to join us aboard the renowned Lady Pamela II Fleet. Our early morning trips and evening trips continue to produce good numbers of various species as we avoid the hottest – and stormiest – part of the day. The past few weeks have seen a return of massive amounts of seaweed between the beach and 20 miles offshore due to Hurricane Florence. The seaweed patches have been holding solid numbers of Mahi Mahi and a species that loves to eat Mahi Mahi as much as we do: Wahoo. The recent moon phases caused an EXPLOSION of Wahoo catches! One of the fastest fish in the sea, Wahoos can melt drags and break hearts if you’re not ready for them. Fortunately, the LP2 Team is ready, willing and able to tame these shiny, striped bait burglars. The Wahoos have been crushing our baits trolled below the surface on planer as well as our Mahi Mahi baits: Islanders with ballyhoo in both the blue/white and red/black color combinations. We’ve been finding the Wahoos in the same depths as Mahi Mahi – we simply pick up the speed a bit on the troll to get the shots. Few things make an angler weak in the knees like watching a Wahoo empty your spool on one of their patented runs! After a long fight and bringing a Wahoo aboard, you’ll enjoy the fact that you get to invite a tasty fish home for dinner. 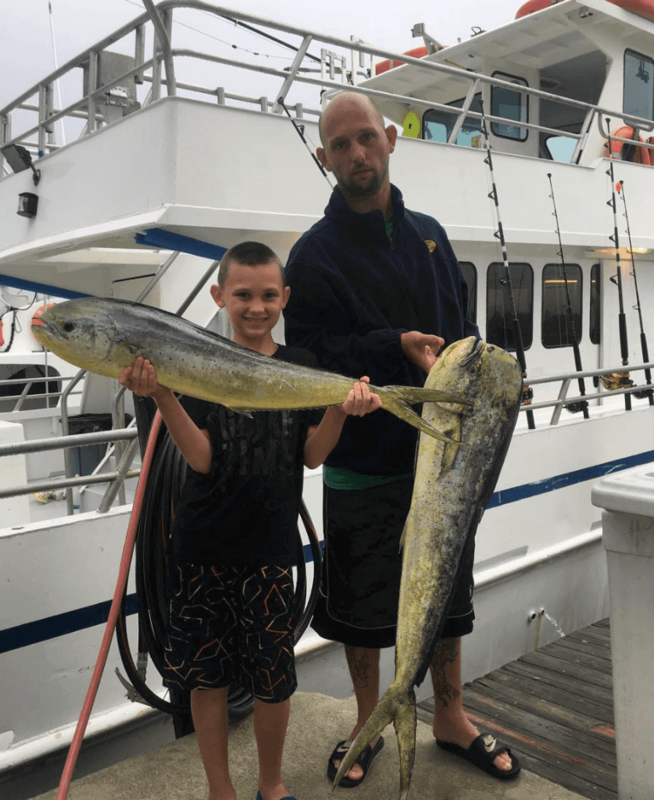 Speaking of Mahi Mahi and dinner, the Mahi bite continues to be very good since there is so much seaweed offshore. As stated above, the Mahi are jumping all over our trolled baits and the occasional live bait that we cast at the particularly large seaweed patches. The amazing August Blackfin Tuna bite slowed down just a hair during September but we continue to do very well, especially with the early arrival of several baitfish migrations. As during August, the entire LP2 Fleet continues to catch Blackfin Tunas ranging from 8 to 15 pounds. We’re finding the Blackfins between 85 feet and 120 feet of water on the troll using Sea Witches and Bonito Strips, trolled at 5 – 6 knots. Large Bonitios continue to be mixed in with the Tunas but they too have slowed down their torrid bite from August. Kingfish are still around in the 8 to 15-pound range, with an occasional 25-pounder between 60 and 90 feet of water. The Kings continue to respond to our baits trolled below the surface on planers. Our Sailfish bite started unseasonably early this year and the bite continues to be solid. 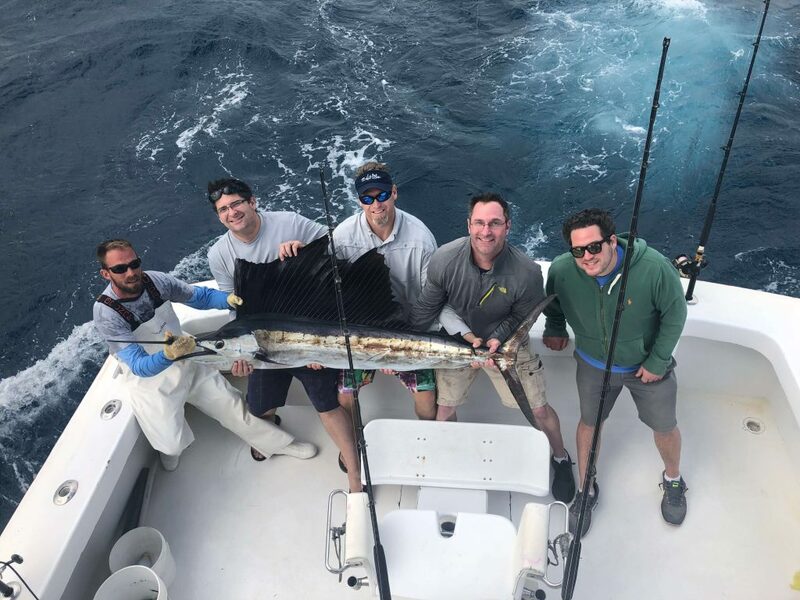 We’re finding Sailfish trolling the rips and edges between 100 feet and 300 feet of water, although the Sailfish are closer to show to await the arrival of the Fall ballyhoo schools. The Sailfish continue to pounce on Sea Witches (in blue/white and pink/white color combinations) trolled on the surface between 7 and 9 knots. and rigged Ballyhoo trolled on the here have also been some sailfish around on the edge. The bite is also picking up on live baits although we can’t cover as much ground as on the troll. There are a few large Barracuda mixed in when we troll for Sailfish near the 100-foot depth. The shark fishing continues to get better and better! September kept our hot streak going as we continue to put clients on big sharks, with each trip landing at least one shark, with most trips catching several. 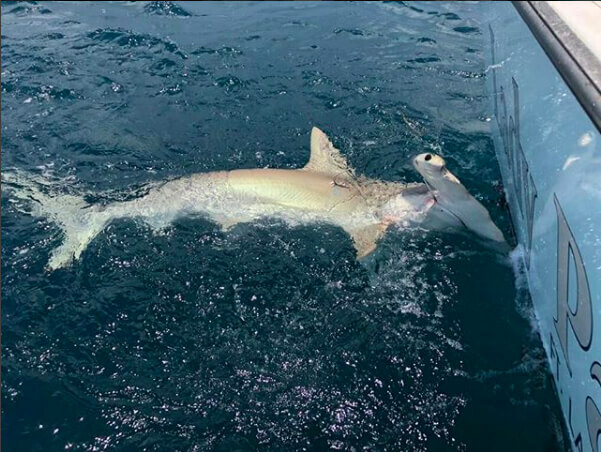 Hammerhead Sharks continue to be the favorite of our clients. Hammerheads are one of the most-prized and unique sharks in the Atlantic Ocean and always seem to capture the imagination of our clients! Caribbean Reef Sharks and Blacktip Sharks have stayed in the mix as they have for most of the summer. The best shark baits continue to be Bonito or Kingfish dropped down in 300 feet of water. The Lois Ann is starting the Fall the way she ended the Summer by continuing to bring the meat back to the dock along with grinning and sore anglers. 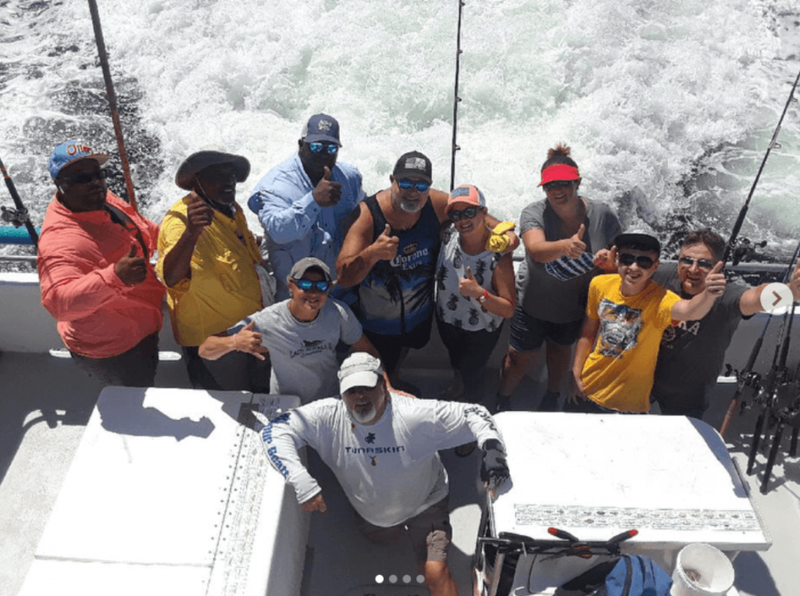 Our day trips have been full of Kingifsh, Bonitos and Blackfin Tuna with the best bites on ballyhoo, sardines and butterfly jigs that get deep into the water column. Our recent night trips continued to produce catches of Mangrove Snappers and Mutton Snappers. Squid and live baits have been the best way to get the Muttons to eat but they can be finicky and absolute beasts once you set the hook. We expect the Night Trips to only get better as the bait migrations commence. Check out this Hog Snapper, a very rare catch on rod and reel! 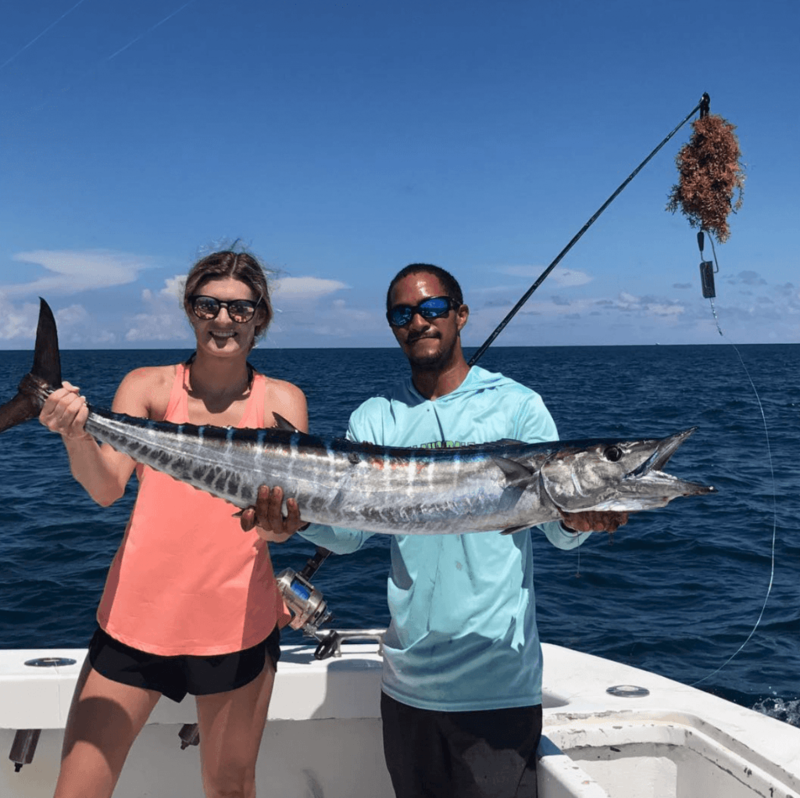 Come join us while this fantastic Wahoo bite is on! Call us to book a trip and let the Lady Pamela II Team introduce you our exceptional Fort Lauderdale offshore fishing.